Chagatai Khan: Benazir Bhutto: A Threat to National Security. Was there a covert war raging between a sophisticated intelligence agency and the PPP government? And did the crisis in the Gulf have anything to do with Ms Bhutto’s ouster from office? After the dust begins to settle over the dissolution of the assemblies, it becomes clear that Benazir Bhutto’s ouster was directly linked to the fact that the army’s patience with her government had run out. Differences between the two had fuelled much media speculations for the entire duration of the PPP’s 20 month tenure. Issues as diverse as Sindh, Kashmir, postings, corruption, and Afghanistan had caused much tension between the ruling party and the military establishment. But the differences were more deep-rooted than a mere disagreement on some issues. It was clear, from the very outset, that the army had very reluctantly allowed Ms Bhutto to take office, and motivated every move and mistake she made during her 20 – Month Rule. The distrust between the Prime Minister and the army has never been too far below the surface and dates back to the period when Ms Bhutto’s father, the executed Prime Minister Zulfikar Ali Bhutto, was in power. According to one analyst, “The defence establishment would have never allowed Benazir to come to power, had it not been for the pressure exerted by the US. Reluctantly, the army bowed to this pressure – probably because Washington controlled its purse strings” The attitude of the military towards the PPP and its leader was clearly evident during the run-up to the elections in 1988. One unreported incident from that period perfectly reflects this deep distrust. Knowledgeable sources maintain that a high official of the intelligence set-up came to Karachi just before polls, and convened a meeting of all the candidates contesting from the Lyari constituency, where Ms Bhutto was a candidate. “We can beat her if all of you agree to withdraw and put-up a single candidate against her, “he was quoted as suggesting to them. But such was the foresight of this hotshot that not only did most of the candidates not agree to withdraw, but the PPP leader subsequently won from the area with a margin of votes that six times that of the votes won by all her opponents put together. Another official of the same agency has been credited with the formation of IJI and sources say, he was largely responsible for masterminding the anti-PPP campaign in Punjab, which was to work with devastating effect both before and after elections. However, on coming to power, Ms Bhutto secured one of the few concessions from the military establishment when she successfully pushed for the removal from the Inter Services Intelligence Directorate of its then Director General Major General Hamid Gul and his Assistant Director General (Internal Security) Brigadier Imtiaz Ahmad. 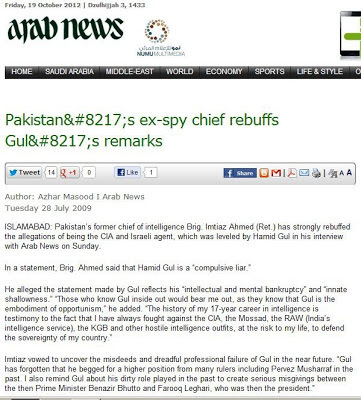 But the removal of Hamid Gul had sting in its tail. Ms Bhutto was not chastened by the fact that the military had forced her to allow the promotion of the ISI strongman, or his posting to the strategically important corps in Multan. 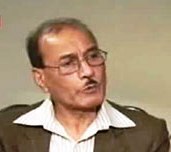 Following the appointment as DG of a Benazir nominee, Lt. General (Retd) Shamsur Rehman Kallue, the powers of the Political Cell of the ISI, working in the guise of the Internal Security (IS), were drastically curtailed. However a serving Major General, Khalid Latif Mughal was posted to run the Afghanistan and Kashmir policies. Mughal, formally, and Hamid Gul informally, continued to have a major say in both these spheres. While the Prime Minister was willing, perhaps, to allow the army a free hand in handling the Afghanistan and Kashmir policies as a price to keep herself in power, her government appeared to have relaxed because the army’s earlier meddling in domestic politics through the ISI had been curtailed. But a couple of transfers and postings were hardly enough to ensure a pliant military high command. And a determined army was hardly something that the inept Benazir Administration could tame quite easily. Although the political cell at the ISI was closed down, the army launched a two-pronged offensive primarily through the media, which to the credit of the PPP government, remained free all through the party’s short, but eventful, tenure in office. While on one hand, Brigadier Riazullah, an articulate and charming officer, moved into the barracks outside the GHQ which houses the Inter Services Public Relations Directorate, another officer, known for his competence and pleasant demeanor, occupied an office inside the walls of the GHQ. This was the Director General of the Military Intelligence, Major General Asad Durrani. 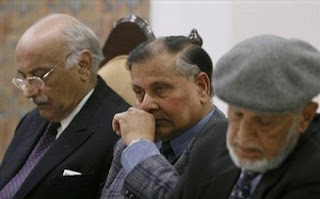 Brigadier Riazullah’s task was to execute General Aslam Beg’s policy of “glasnost” – to wash from the minds of the public, through the media, the negative image of the armed forces had acquired, following the more than a decade long period of Martial Law. The new face of the army was much in evidence when it launched its biggest ever maneuvers – Zarb-e-Momin – in the winter of 1989-90. As a result of an unprecedented media blitz, the “professional soldier” image that the army was beaming out began to sink into public mind slowly but, surely. Side by side with the rehabilitation of its image, the army (with ammunition provided by the antics of the PPP government itself) set about destroying the populist aura of the PPP and succeeded in making corruption the most talked about subject in the country. The army was aided in this endeavor, of course, by the blundering Johnny-come- latelies who came to represent the public face of the PPP. It is clear that a great deal of homework was done, in gathering as well as fabricating evidence against prominent PPP members and the Prime Minister’s husband. Mush of this information and disinformation was handed over mainly to the right-wing journalists belonging to some key papers and periodicals, who saw themselves as the natural allies of the army, having enjoyed close ties with the Zia Regime. At least three people were assigned to feed corruption stories to the foreign media. The DG, MI also adopted an increasingly high-profile role. Although traditionally the DG, MI is hardly someone, given the sensitivity of his assignment, to come before newsmen, the balding Durrani is understood to have personally briefed more than one journalist about the lack of sincerity on the part of the PPP in handling the Sindh situation. This same officer reportedly maintained contact with dissident PPP members of parliament and dictated strategy to them. Similarly, in Karachi, where the MI had grown to many hundreds-strong since the early 80s, Brigadier Jamil and a couple of other officers personally briefed a select band of newsmen time and again, offering them “evidence” of corrupt and criminal activities of the government. While in Hyderabad these stories were leaked by a Colonel Ayub, in Lahore the main channel of contact with the media was a top aide to fromer Chief Minister, Nawaz Sharif, who coordinated closely with a group of Pro-Estbalishment Right Wing Journalists planted in different papers and periodicals. And this was not all. There was something more deep-rooted going on, as an interview with at least one Corps Commander revealed. The gentleman insisted on blaming a PPP minister for planting stories against him although this was not the case as independent investigations subsequently revealed. 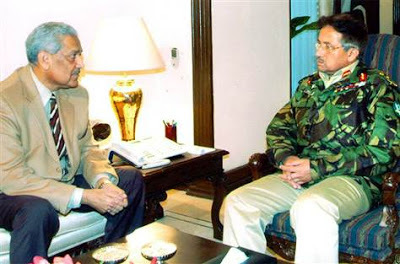 To this day, however, it is not clear who was briefing the Corps Commander on the “enemy-like” attitude of PPP ministers. The urgency of the army’s desire to see Benazir removed is clear from an article by a journalist, reputed to have very close ties with the army bosses. The report, published soon after the fall of the Bhutto government, alleged that while Ms Bhutto was an opposition leader, her mail used to leave the country courtesy the diplomatic pouch of the Indian mission. The journalist proceeded, without naming sources, to question the patriotism of the elected prime minister. But despite this deep rooted prejudice, the army tolerated Benazir Bhutto for 20 months. What then was the catalyst to her being pushed out of the office in a “constitutional coup”? Knowledgeable quarters point towards two factors that may have served as the proverbial straw that broke the Camel’s back. The first of these was the Alam Jan Mehsud incident. Lt General Mahsud, the Corps Commander at Lahore enjoyed the reputation of being a top class professional soldier. His excellent strategy during the course of Zarb-e-Momin, defence experts say, earned him the reputation of “Pakistan’s Rommel”. The Prime Minister reportedly conveyed her desire to the GHQ to grant Mahsud an extension, and post him as the Deputy Chief of Army Staff – an act that military establishment viewed as direct interference in the army affairs. What they suspected was that Ms. Bhutto was placing a well known dove in a strategic position as a potential successor to the present COAS. The army’s response was swift. A replacement, Lt General Ashraf, was rushed to Lahore and, the day after, Mahsud’s photograph was carried by various newspapers, receiving the Corps Shield as a farewell gift. Within days, Mahsud had left for a month long holiday to the tribal areas Waziristan, to spend time in his home village. Knowledgeable quarters say it was in the wake of the Mahsud incident, that a Corps Commander tried to convey to the government that the army was planning to move against it. He reportedly said that the military leadership complained to the President that Ms Bhutto was attempting to foment “divisions” in the rank of the army. The army, which has prided itself on its discipline and the unity in its ranks even during the imposition of Martial Law, couldn’t possibly be expected to tolerate what it perceived to be an attempt to divide it. The other important factor that could have acted as a catalyst was the tilt in the balance of relations between the Pakistan Army and the US administration. Ironically, Ms Bhutto has alwayslooked towards the US as a staunch ally. While it is true that the US administration had much to do with the restoration of democracy in Pakistan – as well as the nomination of Ms. Bhutto as prime minister after her party emerged as the largest single party in the elections – it is equally true her party emerged as the largest single party in the elections – it is equally true that the US strategic interest vis a vis Gulf, are far more crucial to it then romantic notions of third world democracy. Well informed sources in Islamabad say that on a number of occasions in the past, Washington had told the army that any attempt to brush aside democracy would be met with a stiff reaction, including a cut off in aid – particularly now that the Soviets had vacated Afghanistan. Given Pakistan’s tension with India, the defence establishment was hardly likely to jeopardize relations with its key hardware supplier. However, with Iraq’s invasion of Kuwait and the threat of an onward march into Saudi Arabia, the US apparently needed the support of the Pakistan Army. In fact, US Ambassador Robert Oakley told a meeting at the Institute of Strategic Studies in Islamabad, just two days after Benazir’s ouster, that Saudi Arabia had requested troops from Pakistan. Although the once again retained Foreign Minister Sahibzada Yaqub Khan, as well as an army spokesman, denied having received any such request, the US envoy has neither retracted nor clarified his earlier statement. The Empire Strikes Back by Abbas Nasir [Monthly Herald January 2008] August 6, 1655 hours… a group of army officers-whose men have already thrown a ring around the Prime Minister’s Secretariat – enter the multistory white building and advise all the staff to leave and not to return until further orders… A similar scene is being enacted at most other key buildings and installations in Islamabad as battle ready troops jump out of their gun-mounted trucks to surround the radio and television stations, the Directorate of Intelligence Bureau, the Federal Investigation Agency, important ministries and, of course, the erstwhile Sindh House – the official residence of the Prime Minister of Pakistan. Jawans and officers of the FF Regiment, and contingents from a battalion of the Special Services Group take up positions near the parliament building as the president prepares to address a press conference that has just been announced. The high-profile army presence in the Federal Capital leaves a little doubt in any mind that President Ghulam Ishaq Khan’s announcement has the solid backing of the country’s powerful defence forces.. By this time, everybody in Islamabad, with the exception, perhaps, of the Pakistan’s People’s Party government has a fair idea of what is happening. The turbulent 20-month honeymoon between PPP and the establishment is all but over. A little after five, the President administers the last rites at a press conference at the Aiwan-e-Sadr. The Empire – which allowed the PPP to take office following polls in November 1988 – has finally decided to strike back. After reading from a lengthy charge sheet, President Ishaq quotes a number of constitutional clauses and then announces the dissolution of the national assembly and the dismissal of Benazir Bhutto’s government. Unlike the speech of the late General Ziaul Haq on May 29 1988 – in which he announced the dismissal of Junejo’s Government – Ishaq steps doesn’t surprise anyone. The action comes on the heels of a multitude of corruption scandals, the government’s abject failure in arresting the Sindh situation, reports of serious differences with the army, as well as acrimonious confrontation between the Centre and the Provinces of Punjab and Balochistan. Shortly afterwards, the nominated Caretaker Prime Minister Ghulam Mustaf Jatoi takes oath of office, fulfilling a long-standing ambition, and four ministers are sworn in simultaneously. There are two surprise inclusions in the cabinet – Rafi Raza, a man known in the past primarily as an aide to Zoulfikar Ali Bhutto, and for his strong US Connections. Raza has returned following a long absence in the political wilderness. The second surprise is the inclusion of the controversial Ghulam Mustafa Khar, on whom the establishment is reported to have a stack of files as high as the Margalla Hills. The two other ministers – Illahi Bux Soomro, who was a minister in the Martial Law period but was pushed out into the cold after having lost in the 1988 elections, Senator Sartaj Aziz, also a minister in the Zia period – are both known Zia loyalists. Meanwhile, the Chief of Army Staff, General Mirza Aslam Beg, comes out with the quote of the moment when mobbed by journalists following the oath taking ceremony. “We are not involved in politics. We have never been involved in politics. We will never be involved in politics.” Within a matter of hours, Sindh Governor Fakhruddin G. Ebrahim refuses Ishaq’s request to dissolve the provincial assembly and is replaced by Mahmoud A. Haroon , former interior minister in General Zia’s Martial Law government, who then signs the dissolution order. Jam Sadiq Ali, until days earlier a staunch Benazir Bhutto supporter, is sworn in as caretaker chief minister of the troubled province. Frontier Governor, Amir Gulistan Janjua, meanwhile sends the Sherpao government and the legislature packing, and Mir Afzal Khan, an industrial tycoon and a former Z.A. Bhutto government minister, takes over as the caretaker chief executive. For the opposition-led provincial governments, a more dignified and, perhaps cosmetic exit if facilitated. In the Punjab, Mian Nawaz Sharif is not sacked and give time to advise dissolution to the new governor, Mian Muhammad Azhar, the Lahore mayor and a close relative of the Punjab strongman himself, who replaces General (Retired) Tikka Khan. Meanwhile a close associate of Nawaz Sharif, Ghulam Haider Wyne, takes oath of office as caretaker Chief Minister of the most populous province of the country. Mir Humayun Khan Marri, the son-in-law of Nawab Akbar Khan Bugti replaces him as Chief Minister after the latter sends advice to the Governor, General (Retired) Muhammad Musa, to dissolve the Balochistan assembly. Meanwhile, in the Federal Capital itself, correspondents who rush to file their dispatches, find all telex, fax and international dialing lines out of order. The lines are not restored till 2230 hours. In effect, Islamabad is cut off from the rest of the world until the new order is safely put into place. Benazir Bhutto gives her reaction at a press conference at 1930 hours. She says she has been ousted in a “Constitutional Coup”, but informs journalist that President Ishaq’s hand was forced. Asked who forced the president to dismiss her government, she responds, “I leave that to your imagination.” After the press conference, a PTV crew that has covered the vent, hands over the video to an army officer at the gate of Sindh House. Inside Sindh House itself, the STD lines are cut off and restored about seven times and the T&T authorities inform an aide to Ms. Bhutto that they are only following orders. As the just-ousted Prime Minister sits down to dinner, some party people, mainly former ministers, drop in. She picks up the phone, tells her ADC to send in more food, then laughs at his response and puts the phone down. Benazir Bhutto turns round and apologizes to her guests for not being able to lay out a proper dinner for them. The kitchen staff – as well as the crockery – have been summoned out of Sindh House. Even the next day, lunch is eaten out of boxes ordered from a caterer. While the troops clear out of Sindh House and the TV and Radio Stations the next morning, the PM Secretariat, as well as the DIB and FIA offices are visited by a steady stream of army men – some in plainclothes – for several more days. Hundreds of files are taken away from the premises, no doubt to reappear as a damning indictment of the fallen government. Meanwhile, Major (Retd.) Masud Sharif, the Joint Director of the IB, and later, six of his staffers, are reportedly arrested and taken to an unknown destination for interrogation. Two days after his nomination as Caretaker Prime Minister, Ghulam Mustafa Jatoi addresses a press conference and lays a great deal of emphasis on the accountability of the previous government. The forthcoming elections, that are barely 77 days away, are played down somewhat, fuelling much speculation and reviving bitter memories of the past. The same day, in Karachi, Benazir Bhutto finally explodes at a press conference and charges that the Military Intelligence (MI) was responsible for her ouster. She goes to the extent of alleging that the draft of the President’s speech was prepared by the JAG (Judge Advocate General) branch of the Pakistan Army at the GHQ. Either naively, or reflecting her own political compulsions, she absolves the Chief of Army Staff and the Corps Commanders of any blame, thus distancing them from the MI and JAG Branch, and perhaps leaving the door ajar for any future compromises. Those in control now also seem to be in a hurry to acquire more and more bargaining chips. Significantly half a dozen persons reputed to be very close to Asif Zardari, are picked up in pre-dawn raids. As their interrogation begins, there are reports of deals and offer of immunity from prosecution. Events take a mysterious turn, as Begum Nusrat Bhutto leaves the country in a departure that is still unexplained. In the wake of the ouster of Benazir, numerous theories are being floated in the Federal Capital, with conspiracy theorists in hot demand. From deals between the PPP and the army, culminating in the exit of the Bhuttos from the Pakistani political scene, to a grand design by the army to completely discredit civilian politicians through appointments like those of caretaker set-up – all kinds of scenarios are being discussed and debated in Islamabad. Democracy in Pakistan, it is clear, has entered a critical new phase.